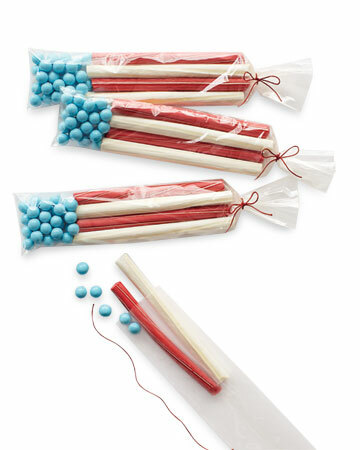 Treat Round-up for the Fourth! 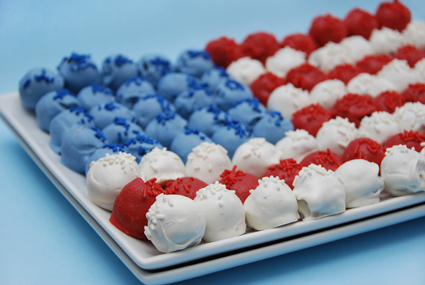 In an attempt to be festive..and because I’m hungry…I’ve rounded up some Fourth of July treats that you can create this long weekend. Each are relatively simple, look incredibly tasty, and of course pass the “adorable” test. Enjoy, and have a great weekend! 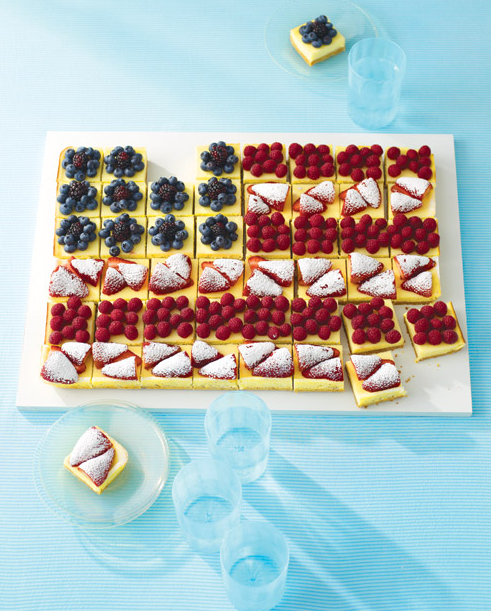 This Fruited Cheesecake Flag from Martha Stewart is summery and sweet. She has all the best ideas; I’d never think to make the “white” stripe from powdered sugar…I’d probably be peeling strawberries to achieve a similar color. 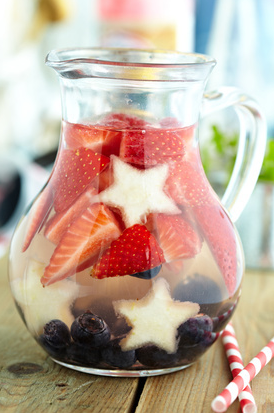 Here’s an easy one for you: a Red, White, and Blue Sangria, with the fruit densities already thoughtfully calculated to give you a perfectly tiered beverage! My Juice Cup has the cutest Cake Pop project for the Fourth. One of the process-shots reminds me of Oreo Truffles, and honestly, I’d be content to make those in the style of these. …You say you don’t know what Oreo Truffles are? Oh my. Google it. You’re welcome. I always hesitate to include two or more crafts or treats from the same source in a round-up, but damn Martha. What can I say. Enjoy these simple flags – you’ll love them if you loved those Rainbow-in-a-bag St. Patrick’s Day thingys that took over Pinterest the entire month of March! 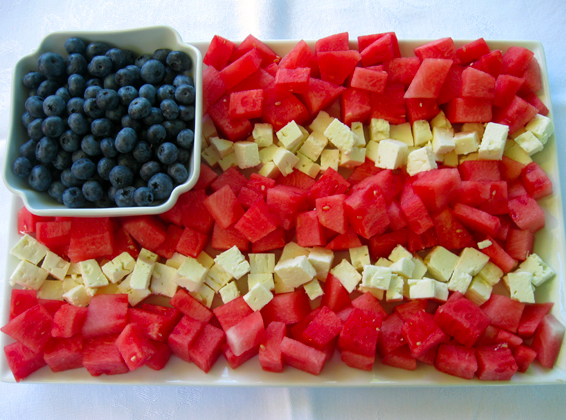 Even though red, white, and blue food is pretty simple to make, it doesn’t have to be super sweet or 100% fruity. Try this ultra-easy-but-still-I’d-never-have-thought-of-it Watermelon and Feta plate from Wenderly. 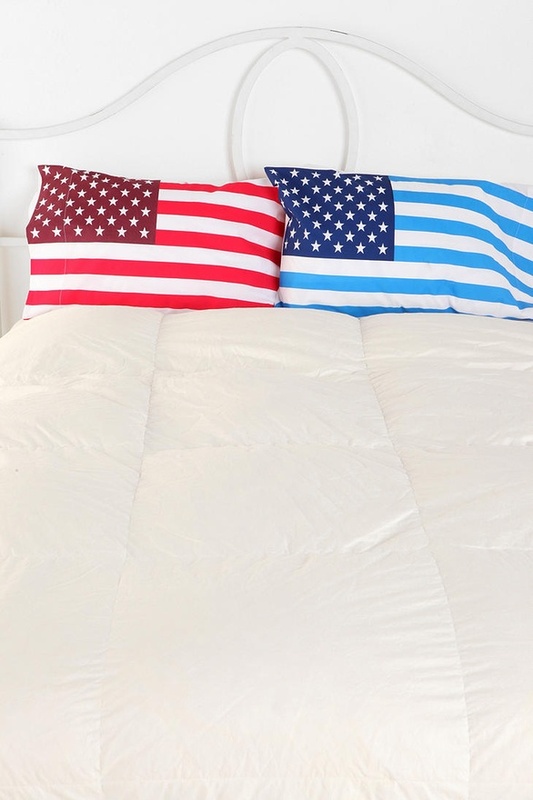 And just because this is a decorating blog and I can’t help myself, don’t forget to throw these pillowcases (which are a set of two from Urban Outfitters…for $34!) on your guest or beach house bed. Love them! A single instance of ombre can range from bright red to pale yellow (as seen in the flowers above), or from a very subtle green to a rich deep green, which keeps the ombre within the same hue (seen in the chic dresser above). It also refers to a hair color technique that is fairly popular right now, where your highlights or “color” is concentrated towards the tips and the natural or darker color is at the roots: a style which I have unintentionally – but fashionably! – been rocking for some time now. Another place we’re seeing a lot of ombre lately, and I kid you not, is cakes (shown above): the Pinterest crowd surely knows what I mean! Anyway…ombre is, in a word, pretty. And gentle. And feminine. And modern. 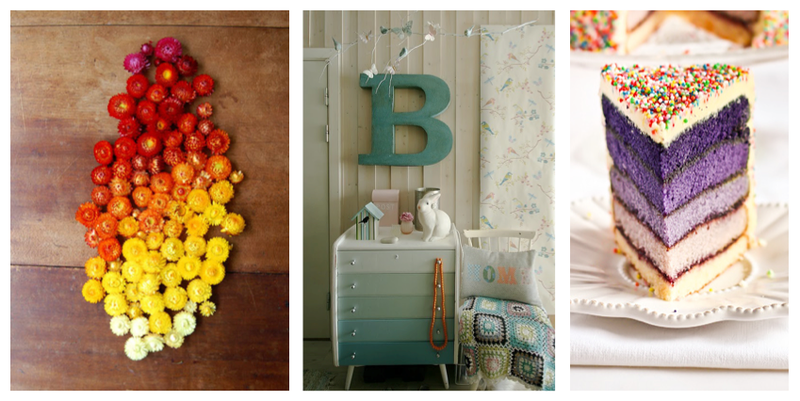 In short: most paint chips you see, with the progression from light to dark, are ombre. Below are some lovely ombre picks. Enjoy! Clockwise from clutch at top: Bruna Ombre Clutch, $195 (image via Calypso St.Barth); Kevin O’Brien Ombre Lilac Velvet Pillow, $218 (image via ABC Carpet and Home); Ombre Laundry Basket from Umbra, $20 (image via Container Store); Ombre Water Pitcher, $25 (image via Uncommon Goods); Le Creuset Heritage Cast Iron Oval Doufeu, $370 (image via Williams Sonoma); Purple Ombre Rug from Liora Manne, price on request (image via lioramanne.com); Wooden Ombre Vase from West Elm, $29 and up (image via West Elm); Dipped Spice Celler Set from Leif, $45 (image via LeifShop); Wedding Stationery from Paper Freckles, price on request (image via Brides); Silk Ombre Ribbon, source unknown – try any craft store. If you have kids, or if you like crafting, it’s likely that you’re going to dye eggs this week at some point. That is, if you didn’t already do it last weekend (I did). Here are seven ways to dye your eggs that go beyond the typical methods. Some are complicated, some aren’t. But they’re all neat too look at and fun to make! Enjoy! 1.) 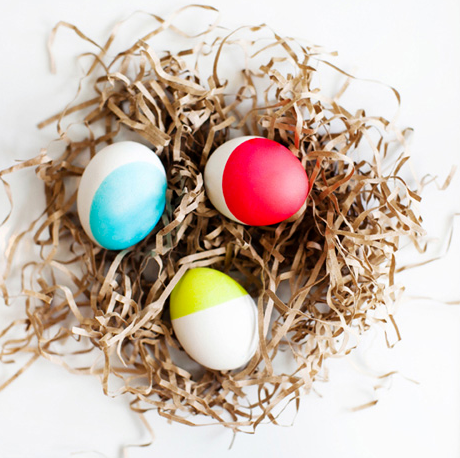 These Neon Dip-Dyed Eggs from Oh Joy are mod, colorful, and look incredibly easy to make! 2.) 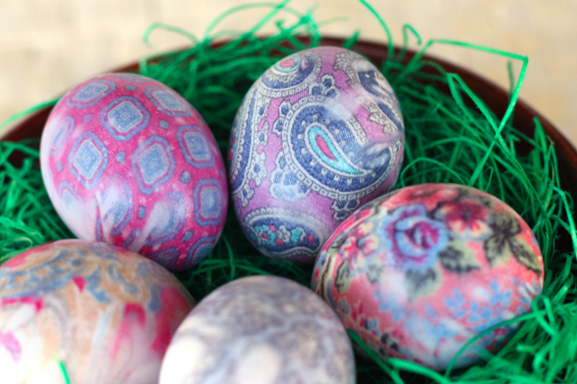 I made some of these Silk-Dyed Eggs (aka Tie-Dyed Eggs) from Our Best Bites this past weekend. Many thanks to my friend’s husband for sacrificing one of his silk ties for our crafting enjoyment. 3.) You’ve probably seen this image floating around the web, especially if you belong to Pinterest. 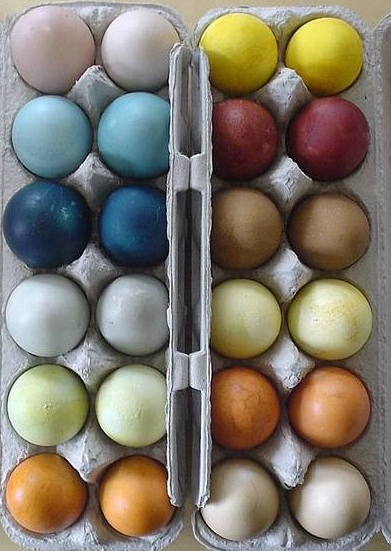 Make your own Natural-Dyed Eggs via Two Men And A Little Farm. 4.) 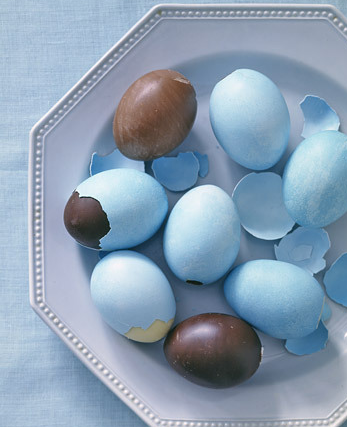 These Chocolate Surprise Eggs from Martha Stewart are not just edible – they’re DELICIOUS! A bit more work than dunking orbs in dye, but why would you expect anything less than “a little bit labor intensive” from Martha? 5.) Thought I’m still not 100% sure how you make these, the Chap Stick Eggs from Oh Joy are stunning and perfectly imperfect. Give it a try! 6.) 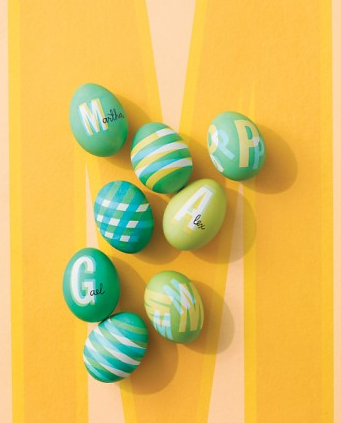 These Graphic Eggs from Martha Stewart stole my heart: vibrant, typographic, and shockingly easy! 7.) 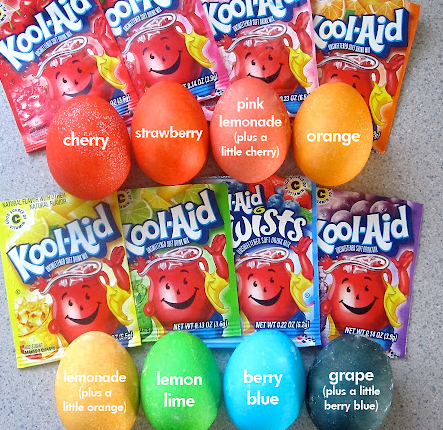 Last but certainly not least in this round-up are Kool-Aid Eggs from Hey Jen Renee. I can’t say that I ever would have thought of this, but the results are stunning! I wonder if it works with Jell-o? So there you have it: seven dazzling ways to decorate your eggs this Easter. I can’t wait to try them! 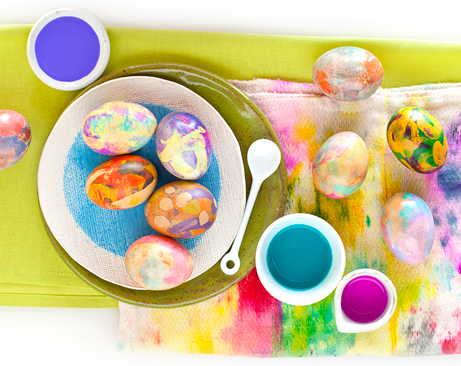 What’s your favorite way to dye Easter Eggs? And do you have any other ways to share?